So I’ve decided to spend 2016 destashing. Said decision gave me a kind of lightness of being—anticipating the freedom of having fewer possessions—which apparently made me feel free to turn around and indulge in the big Knit Picks sale last month. (Have I mentioned how susceptible I am to sales?) Silly, I know, but we knitters are very good at tricking ourselves into thinking we need more yarn! In my defense, I have patterns picked out for everything I bought. The purple in the back was only $12 for an entire t-shirt’s worth! And the self-striping Felici colors are even prettier in real life than they were on the website. Can you tell I’m deep in a purple phase? 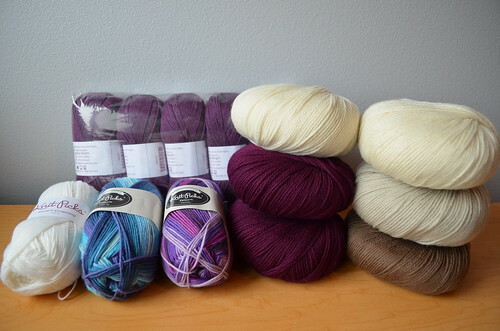 A trend that’s really caught my fancy this year is gradient yarns and kits. For the last several years there were just a handful of people dyeing slow-change gradient yarns in single skeins; but this year it seems like tons of indie dyers are selling kits with mini-skeins of several solids that you can put together to form a gradient. I’ve been coveting them for some time, and finally splurged on a set of gradient “puppies” from YOTH Yarns at the Knit Fit marketplace. 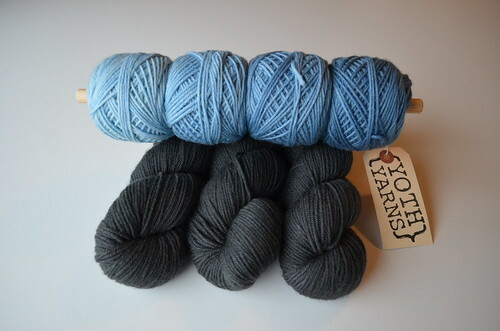 Danny (YOTH’s “little brother”) made the excellent recommendation of pairing the ‘Cracked Pepper’ colorway with my blues, and all of a sudden I had a sweater’s quantity in my bag. Oops, how did that happen?! :-D I’m thinking of making something similar to Dorie’s gradient sweater, although I’m open to suggestions. I am hoping to knit from stash in 2016. This post makes me want to go sort and organize. Personally I find the sorting satisfying! I had to dig around the house to gather everything together for this photo, and it felt good to have everything in one place. Good luck with your goal!